When the iPhone was released it started a trend toward rethinking how we look at the web. The Internet is no longer confined to the quietly humming box beneath our desks, or the glowing lap-warmer we carry around in briefcases and notebook cases. The web is going mobile, and the iPhone was released with the intention of spearheading this movement. The screen is larger, it’s Wi-Fi capable, and makes use of a revolutionary multi-touch-screen interface for everything from taking a picture, to making a call, to browsing the Internet via a full version of Apple’s Safari web browser. Google Apps mobile version now makes use of Google’s suggest engine to complete search terms when entering them using the iPhone’s soft keys. Pages load immediately, which makes browsing on the iPhone just as fast as browsing from a desktop or notebook computer. 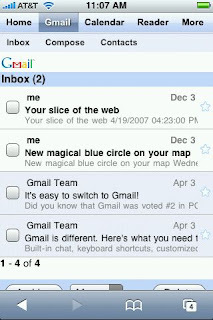 Links to Gmail, Reader, and Calendar have been placed at the top of the screen so they can be accessed more easily. Theses optimizations will eventually be released for other mobile devices and PDAs.